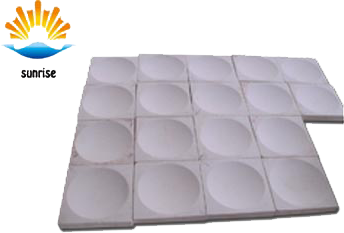 Glass mould brick is one of the important tools for glass moulding and forming. Its quality will directly influence the appearance and production cost of glass products. In the glass forming process, the glass mould is required to withstand high temperature in the long-term use. The glass liquid will stay in the mould for 5-60 seconds. The initial temperature of glass liquid is between 900-1100℃ and the final temperature is 500-600℃. If the mould has bad high temperature resistance, it is apt to crack during use. The temperature difference during moulding is 400-500℃. The glass liquid will stay in the mould for 5-60 seconds. The mould is required to dissipate the heat during the 5-60 seconds. Different products have different requirements on the thermal diffusion rate of the mould. For large products, the thermal diffusion rate is required to be low, since they have low forming rate and long residence time. For products that have high forming rate and short residence time, the thermal diffusion rate is required to be high. In order to accelerate the solidification of products, the products and mould will be cooled by air. After the products are removed from the mould, in order to maintain the clearness and dissipate the heat in time, the mould will be cooled by air again. All these constitute thermal shock to moulds. So, glass mould brick should have good thermal shock resistance, or it may crack. When glass mould brick has significant expansion during use, it will not only make the forming and demoulding difficult but also cause big joint seem in the junction of products and the burst of products during demoulding. It will also cause deformation of moulds and make the products deformed and inaccurate. Thus, it should be made of materials with low thermal expansion coefficient. Since oxidization is one of important factors causing the corrosion and damage of moulds, the glass mould brick should have good resistance to oxidization. Besides, the mould should be easy to process and repair.